Gorging on farm-fresh fruits and vegetables is one of the greatest perks of living in the Bay Area, where our farmers’ markets are legendary. 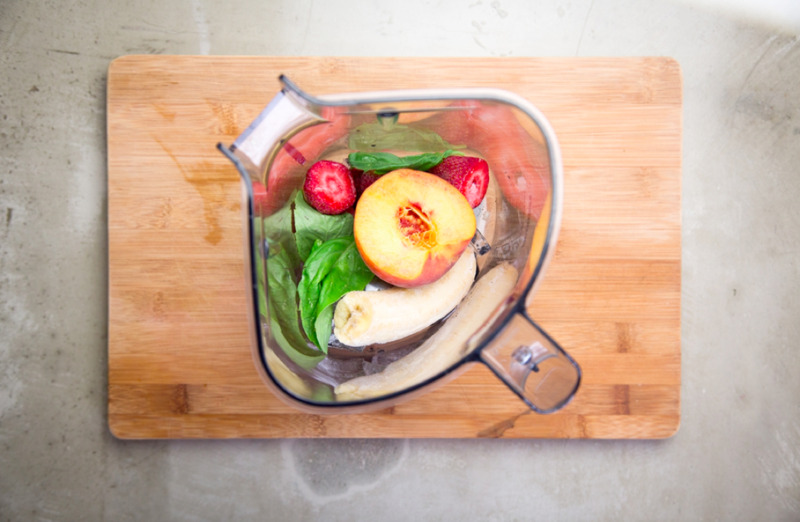 So when it comes to smoothie and juice bars, we don’t mess around with additives and fillers—the flavor comes straight from seasonal produce. Whether you prefer to slurp down your greens or just want a healthy pick-me-up, these are the best smoothie shops in the city. 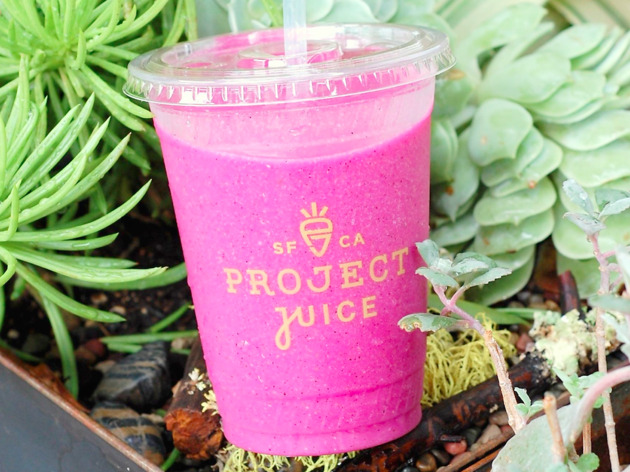 Photograph: Courtesy Native Juice Co.
Project Juice touts five locations throughout San Francisco (plus one in Palo Alto), all offering cold-pressed juice, “superfood” smoothies and health-conscious breakfast and lunch fare. Owners Greg and Rachel Malsin source their organic produce from California farms and often collaborate with local companies like Jane, Samovar and Sightglass. 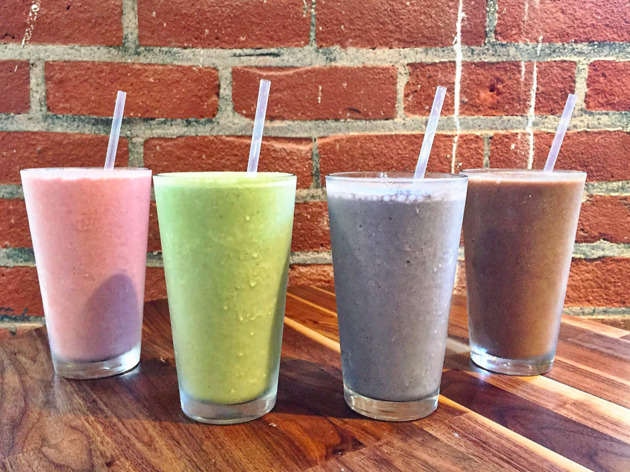 The smoothies are 100 percent gluten-, dairy-, soy- and peanut-free, made from ingredients like house-made almond milk (“mylk”), coconut meat, vanilla bean, chia jam and maca. (Exotic “boosters” include bee pollen, camu camu and baobab.) 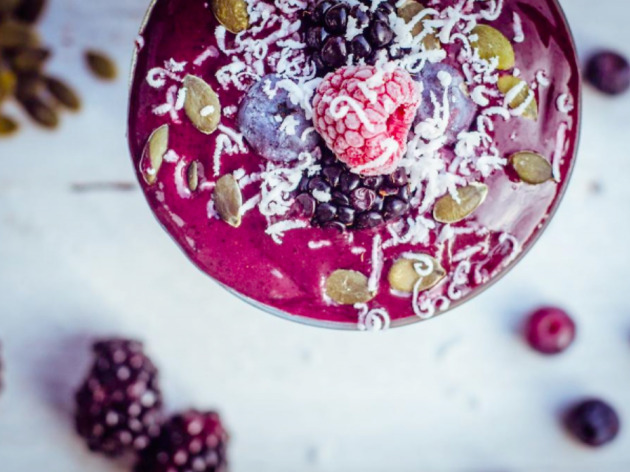 The best-seller is the AB&J, a healthy spin on the classic PB&J that’s made with almond milk, coconut meat, almond butter, dates and superberry chia jam. 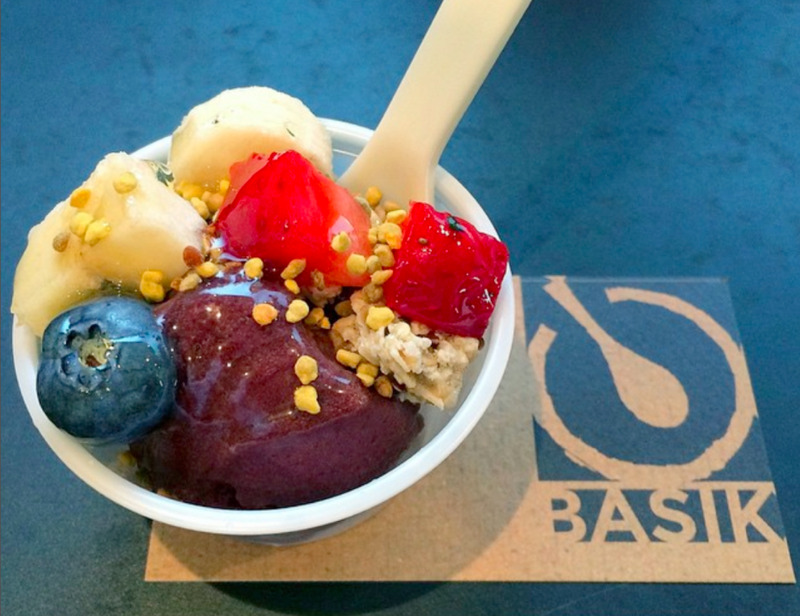 Bay Area natives Reza Morvari and Angel Serratos first parked their Bowl’D Acai food truck in San Francisco in August 2014. 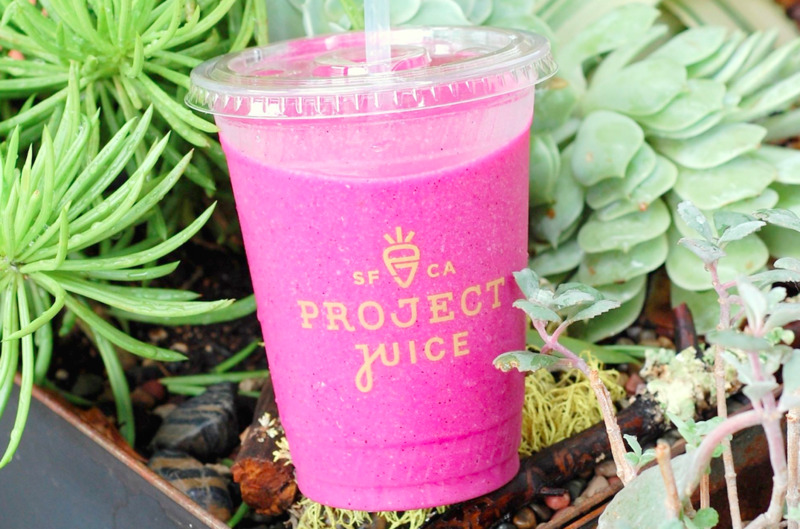 The rig does brisk business in front of the mid-Market Blue Bottle on weekday mornings, when regulars line up for smoothies, raw juices and acai bowls. All the smoothies are made to order using Berkeley Bowl produce. The best flavor of the bunch is the Beast Mode, a creamy, surprisingly filling concoction of banana, strawberry, acai, vanilla whey protein, chia seed, flaxseed and house-made almond milk. Morvari and Serratos, who usually helm the truck themselves, are happy to customize any drink with added protein, flax or other supplements. 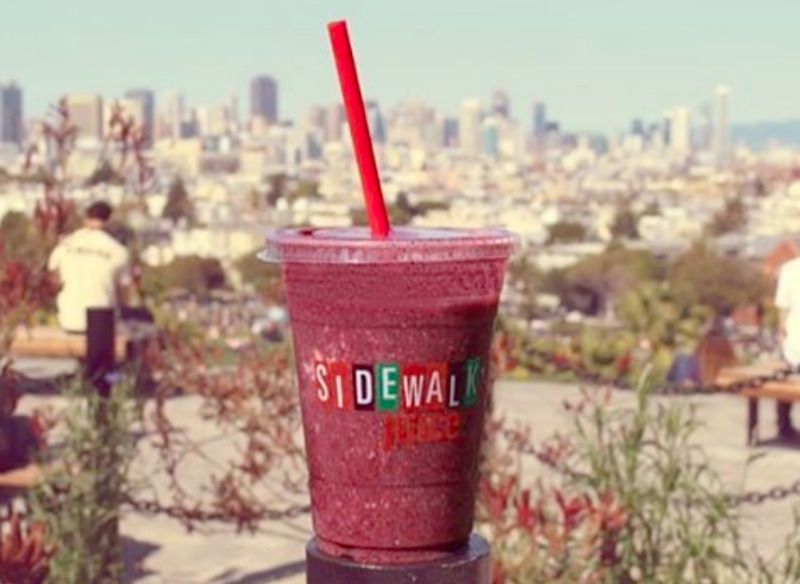 Situated just across the street from Dolores Park, Bebebar is a Mission fixture serving acai, juice, smoothies, mate and empanadas. Owner Celinha Moreira, a Brazilian transplant, opened the cafe in 2014. It’s an homage to the surrounding neighborhood, with tables, lighting and art created by San Francisco artists and menu items named after a handful of local kids. The Indra, for example, is a milkshake-like blend of soy milk, banana, cocoa and dates, while the Sandyia combines almond milk, banana, strawberry, peanut butter and oatmeal. 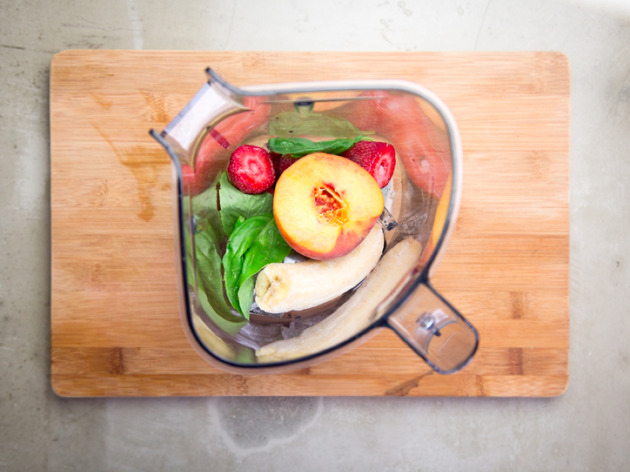 Though most of the smoothies skew sweet and fruity, you can toss in a scoop of fresh spinach or kale for 75 cents. 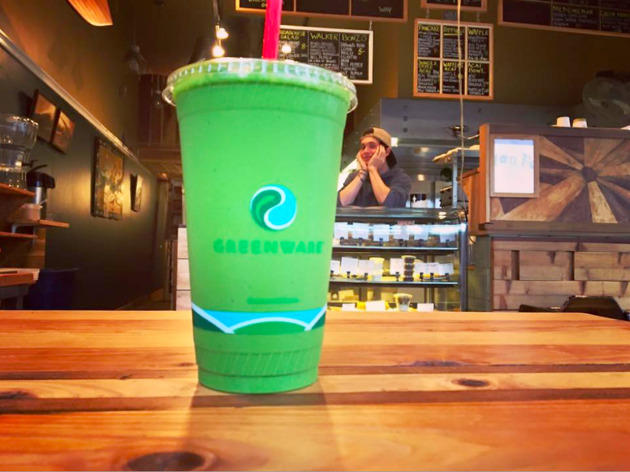 The vibe may be a little sanctimonious—the shop’s motto is “Fountain of Paradise,” after all—but it turns out that taking health-food seriously yields some seriously tasty fare. The narrow spot is sunny and spotless, with a vertical garden climbing one wall and a colorful mural swirling over the counter. 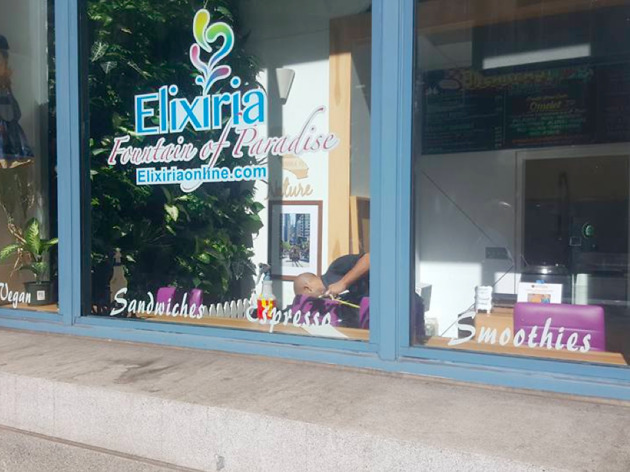 In addition to smoothies, Elixiria serves vegan breakfast and lunch dishes (salmon, roasted veggies, rice bowls), vegan and Paleo desserts by Real Food Kitchen, nut-milk milkshakes and boba. The raw smoothies are infused with essential oils and unusual ingredients, including Icelandic kelp, young coconut, chia seeds and wild yam. Each drink purports to boost the body in some way, from the detoxing Lymphomaniac (red grapes, pear, lemon, ginger, cherries, juniper berries and red clover) to the lock-lengthening Bounciful Hair (sweet basil, mint, orange, young coconut, Icelandic kelp and nettle). 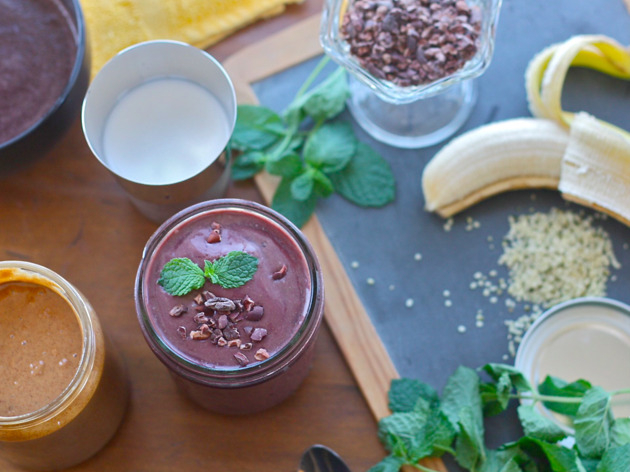 Certified raw-vegan chef Ping Ren is known for her decadent desserts, whipped together from ingredients like almonds, cashews, dates and coconuts. Her Outer Sunset cafe serves raw and vegan salads, wraps, sandwiches and bowls, as well as a full menu of dairy and vegan smoothies. 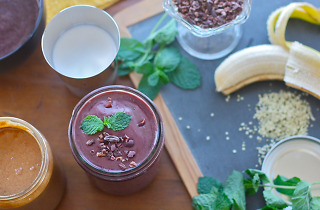 The banana-pineapple-strawberry Double Overhead is a best-seller (blended with non-fat frozen yogurt and pineapple sorbet), while the vegan Superfood Smoothie packs a day’s worth of nutrients into one glass with ingredients like seaweed, ginger, blueberries, almonds, goji berries, dates and more. Basik may be relatively new to the Bay Area—owner Derek Paulson set up shop in early 2015—but it already boasts a cult following in Hawaii. 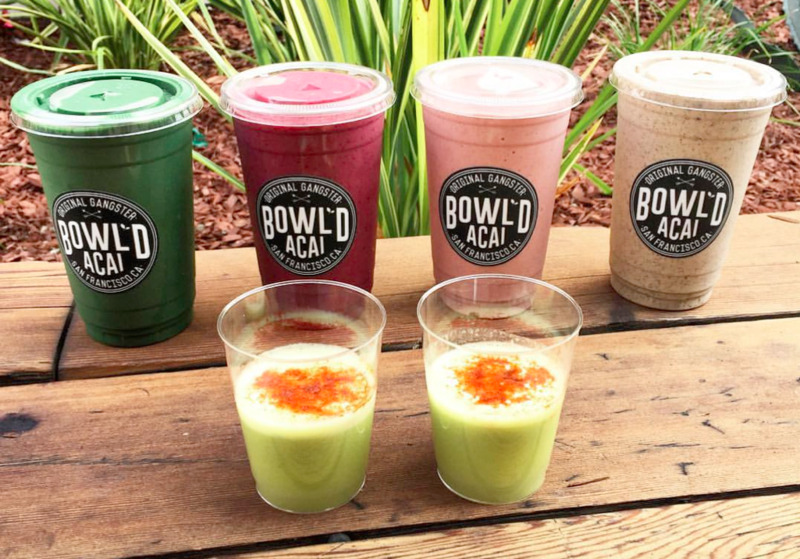 The original Kailua-Kona location has been churning out dairy-free, plant-based drinks and snacks since 2010. (In a nod to its roots, “Aloha” and “Wake Up and Live” are printed across the walls.) 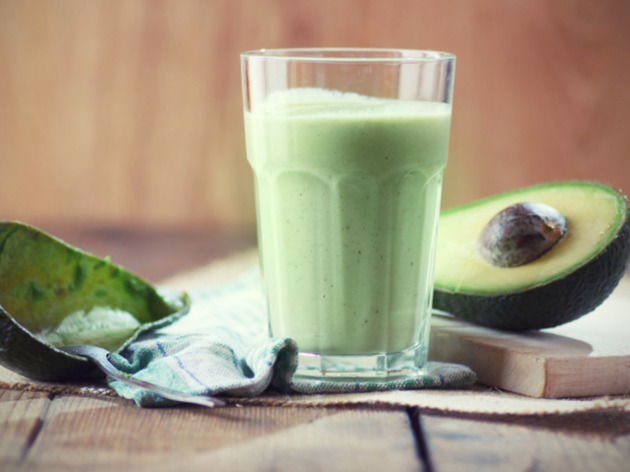 The smoothies are simple and sweet, blended from fruit, juice, honey, greens and plant-based milks. 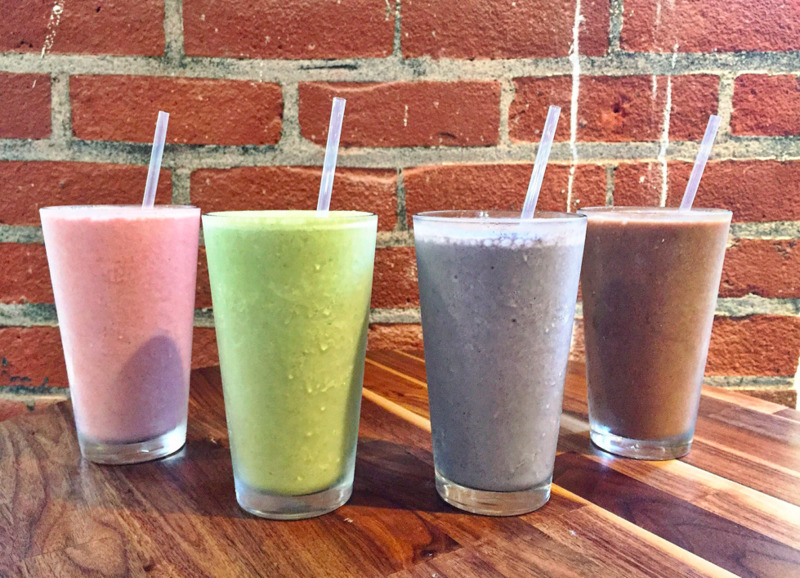 Try the Crunch, an acai-strawberry-banana mix that’s topped with a scoop of granola, or the refreshing Mayan Mint, a concoction of acai, banana, almond butter, mint, hemp milk and cacao nibs. With eight outposts throughout the Bay Area, The Plant is a go-to, guilt-free chain for salads, sandwiches, juice and smoothies. Despite its growing size, the restaurant still sources all its organic ingredients from nearby farms in Marin, Napa Valley, Capay Valley, Fresno and Santa Cruz. The Pier 3 restaurant—impressively renovated from two 1900s-era warehouses—has the largest selection of smoothies, from the eye-opening Banana Buzz (coffee, dates, banana, cinnamon, cocoa powder, almond and coconut milk) to the tart Clean Green (avocado, kale, pineapple, lemon, ginger, almond milk, apple juice and orange juice). 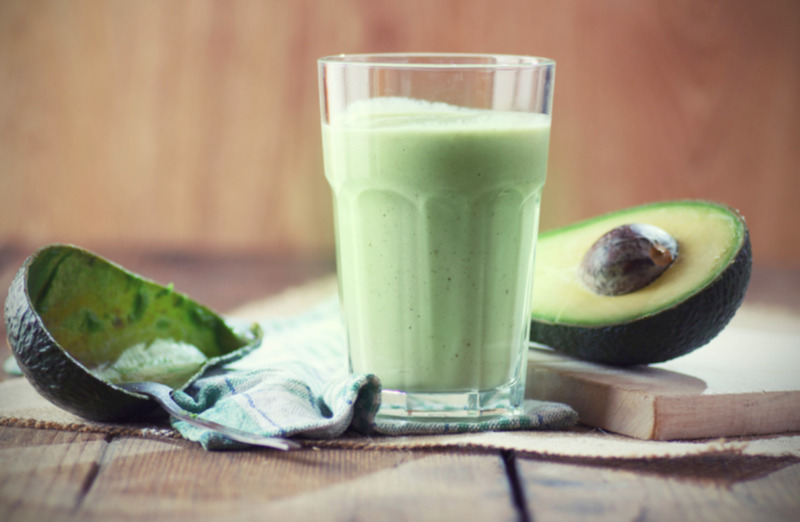 All the smoothies offer the choice of almond-, coconut-, or cow’s milk. Add a dose of chia, spirulina, bee pollen, hemp protein or almond butter for an extra 2 dollars. This slick breakfast-lunch spot is another Hawaiian transplant: owner Ken Weller helped establish a Blue Hawaii in Honolulu before opening a San Francisco sister-store in 2010. (Though the mall location is hardly beachy, the surfboard-shaped tables are a nice touch.) 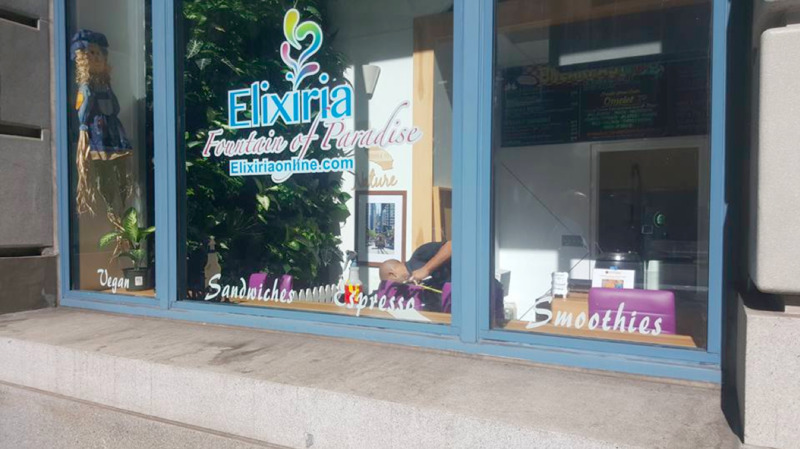 The restaurant has gained a following among the downtown desk-set for its acai bowls, poke bowls and all-natural smoothies. 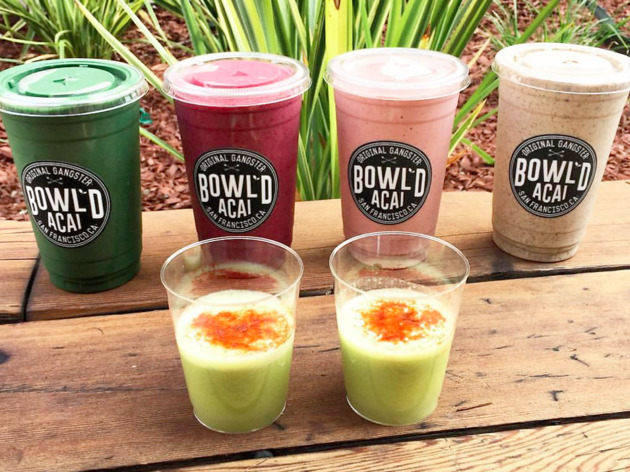 The drinks are dairy- and artificial sweetener-free, blended with organic soy milk and apple juice. Highlights include the Lime Drop, a tongue-tingling blend of acai, berries and fresh lime, and the Pink Dragon, which contains dragon fruit and banana. 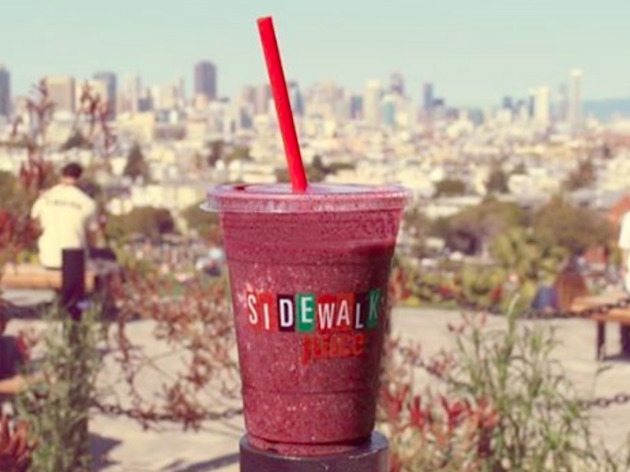 Owner Jason Nazzal owns two Sidewalk Juice shops in the Mission, both serving over 40 smoothies—and nearly 100 drinks in all, including juice, kombucha and wheatgrass and ginger shots. The 21st Street location is a walk-up window, while the 24th Street outpost has bar seating for some unparalleled people-watching. Dessert-y options, like the Chocolate Chai and the Nuts About Nutella, are sweetened by vanilla frozen yogurt, while healthier blends combine fresh fruit and almond milk or sorbet. The mini-chain’s best-selling flavor is the Blueberry Almond Smoothie, made with almond milk, blueberries, banana, almond butter, vanilla and frozen yogurt.